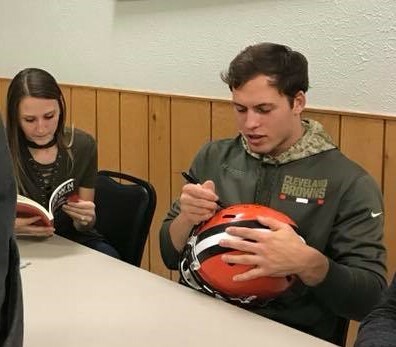 Joe Schobert autographs a fan's Browns helmet while his fiance Megan reads "Brown for the Count." God knows it’s a cliché, but he really looks like an ordinary Joe. No way you’d see Joe Schobert walk into the room and figure him for a Pro Bowl middle linebacker. Maybe a sixth-grade social studies teacher. Maybe a whitewater rafting guide, fit, fresh-faced, and friendly. But in fact, the only 2017 Cleveland Brown to suit up in January made quite an impression on the audience of die-hards at Saturday’s 10th annual Cry in Your Beer Bawl, the banquet of the Southeast Michigan Browns Backers. Six years ago, he was a walk-on from Waukesha, just hoping to fit in with his home state Badgers. A safety, running back, and kick returner in high school, he rushed for 296 yards in a state championship game victory. After a productive college career at outside linebacker, Schobert became just the third “Joe” and the second Wisconsin player to get drafted by the Browns this millennium. All three of them — CB Joe Haden and LT Joe Thomas, the Badger before, have now made Pro Bowls. Schobert did it in his second year after being selected 99th overall and working through an uneven rookie season. In 2017, he moved outside in, to the MLB position in Gregg Williams’ newly-installed 4-3. He started every game and tied for the lead league in tackles, all while wearing the headset helmet that makes him the field general for the defense. Last year, the trade of Demario Davis and injury to Tank Carder left the middle of the defense wide open for Schobert. He emerged as the central figure in a unit that allowed just 3.4 yards per carry, second stingiest in the league. He forced a team-high three fumbles and added three sacks as well. Asked which Browns were most likely to make a similar leap forward in their second year, Schobert was quick to mention two of last year’s first-round picks: DE Myles Garrett and S Jabril Peppers. One fan asked him why Peppers played so far off the line of scrimmage last year that it seemed like it was 11-on-10. Schobert explained the design to lower the margin of error for the young free safety and let him gain experience looking at the field in front of him. Closer to the line, one false step, hesitation, or wrong turn could cost the team a quick touchdown over the top. He said the Browns’ strength against the run and their ability to avoid giving up those big bombs vindicated the decision, even as he conceded that they ended up yielding some big chunks of yardage from shorter passes. Look for Peppers to step up figuratively and literally in 2018 as the strong safety, now that former Packers first-rounder Damarious Randall has arrived at free safety, allowing both to play their more natural positions. Schobert immediately strikes you as a very intelligent and composed young man. His responses were all on point and and unhesitating, indicating lightning-quick processing speed. But that’s a far cry from saying (which no one is) that his judgment should carry the day in the draft room. Asked what the Browns should do with the first and fourth overall picks, he wants players ready to come in and contribute with virtual certainty right away. He doesn’t believe any of the quarterbacks are worth the risk of drafting that high. So that means investing in the likes of top-notch talent such as RB Saquon Barkley and DB Minkah Fitzpatrick, and hoping to maybe get lucky on a quarterback in later rounds, ala Russell Wilson and Kirk Cousins. While I can’t agree with that approach, I get where he’s coming from as a player whose professional record is just 1-31. Careers are short. It’s time to win now. I get it. I hope they do. And I hope Schobert’s understated star continues to rise as the Williams defense finds its own sophomore surge. Listen to Schobert’s Q&A here. This entry was posted in the team today on March 20, 2018 by Dave Algase.